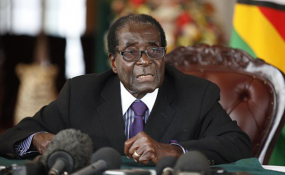 In Zimbabwe, for the first time in decades, state newspapers are no longer referring to Robert Mugabe as "comrade" after the 94-year-old former president reportedly expressed support for the country's newest opposition party. All of Zimbabwe's nationalists and former independence war heroes are referred to as "comrades", a title that harks back to the ideological training many got from the former Soviet Union and China. But Mugabe's reported foray into opposition politics appears to have cost him his own rank. Mugabe last week expressed support for the National Patriotic Front led by former cabinet minister and ally Ambrose Mutinhiri. Some officials in the ruling party have rounded on Mugabe for that, accusing him of trying to destabilizs Zanu-PF. The state-run Herald and Chronicle newspapers were on Wednesday referring to the former president as plain "Mr Mugabe". The development left some on social media wondering if Mugabe might even one day be denied a final resting place at the National Heroes' Acre - the Harare shrine where many top former revolutionaries are buried. Said journalist Hopwell Chin'ono on Twitter: He said Mugabe had himself "denied genuine heroes that status on the basis that they would have disagreed with him." Added @ali_naka: "When 'state' media in Zimbabwe starts calling you 'Mr' not comrade, next stop they will call you by First Name like Village twitter you might not make it to 'Heroes Acre'."